Today I thought I'd share a couple of teaching tools with you that we use each day that we have "school". 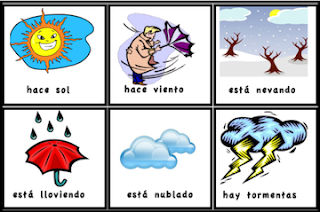 Weather Cards for a Pocket Chart in Spanish. Click the picture above to access and print a PDF of the file I used to create the cards. There are 12 cards and a heading that reads, "El tiempo de hoy". To use, simply print, laminate, and cut apart. Each day after we say the Pledge of Allegiance the boys go outside to "chequear el tiempo". When they come in with their report, I hold up a card and ask them if the weather is whatever is on that particular card. For example I'll say, "¿Hoy hace sol?" If they answer "sí", we put that card in the pocket chart under the heading of "El tiempo de hoy." If they answer "no" we put it to the side. Once we have gone through all the cards the boys take turns telling me about today's weather. For example if it is a sunny, breezy, cool day one kid might choose sunny. He will say, "El tiempo de hoy hace sol." Then my other son will say, "El tiempo de hoy hace aire." The pictures on the bottom of this chart match the pictures in the weather cards for continuity. I have the chart in a clear, plastic page protector hanging on the wall next to our pocket chart. 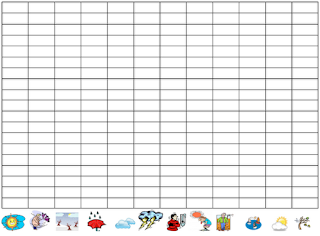 Before we started using this graph each one of us made a prediction about which weather column would have the most days. We wrote our names with dry-erase below our predictions. Each day after we discuss the tiempo, the boys take turns filling in the squares for that day's weather. When the chart is full we will see if anyone's prediction was correct and discuss why or why not.